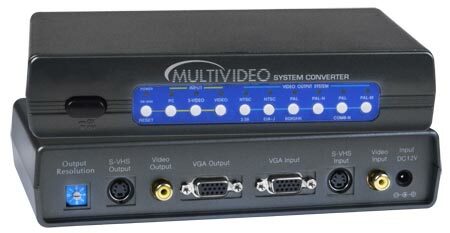 Use the Multivideo System Converter to view your computer output on a TV, or view video input sources on your VGA monitor. Also known as: video format converter, convert PC to TV video signals, bi-directional video converter, two-way video adapter. Convert NTSC/PAL SVHS video or Composite video to a NTSC/PAL TV and PC VGA monitor. Convert PC VGA video to a NTSC/PAL TV and PC VGA monitor.